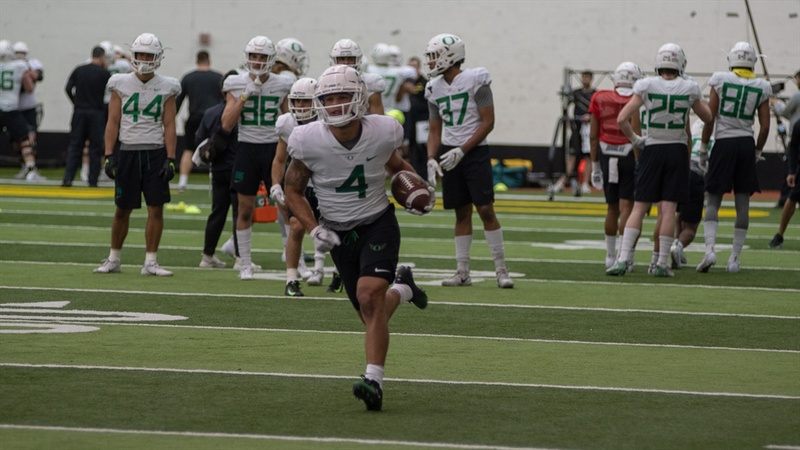 Oregon football officially restarted spring practices Tuesday after getting two weeks off for finals and spring break. Not missing a beat, coach Aaron Feld was his usual hyped-up self. And although the players looked tired at the start of practice, once the music was blasting they were pumped up. The Ducks welcomed more early signees: Mykael Wright, Mycah Pittman, Camden Lewis and Patrick Herbert. They got some reps in with the second, third and fourth teams. Wright did not participate but is expected to work with the team on Thursday. Grad transfer WR Juwan Johnson was also at practice but not involved in drills as he was in street clothes. Johnson arrived late Monday night and was not ready for today’s practice. He could be available to take part as soon as Thursday. Quarterback Cale Millen was also more active coming off an injury, he got some reps in at the fourth team spot. The 30 minutes of practice that the media were allowed to watch featured stretching and warmups, as well as tackling pads, a few positional drills and some offensive plays. All in all, as the roster fills out, it feels more and more like game preparation. After all, we are only 18 days away from the Spring Game and 150 days until the Auburn game.